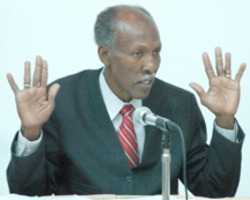 Back on June 29, 2008, Barbados Free Press asked Barbados Lawyer Hal Gollop: Is He Unethical? Underhanded? Back-stabbing? … or Perfectly Proper? The situation we were talking about was that Lawyer Hal Gollop represented contractor Andrew Thomas in a civil dispute involving the SSA and manager Stanton Alleyne… and then later switched sides and represented SSA manager Stanton Alleyne when Alleyne was fired by the SSA over a thousand dollars received from Thomas. Gollop represented Alleyne even as the original dispute between Thomas and the SSA/Alleyne was still ongoing! Alleyne took two cheques from Thomas and refuses to tell anyone what they were for. Thomas stated in writing that the cheques were a secret “commission” to Alleyne for Thomas being awarded a government contract from the SSA. And just the week before receiving the money from Thomas, acting SSA manager Stanton Alleyne wrote an official SSA letter to the Caribbean Commercial Bank informing the manager that Thomas had just landed a big SSA government contract! Andrew Thomas later claimed that he wasn’t paid for the whole contract that Stanton Alleyne detailed in the letter to the bank…. so from the start, Stanton Alleyne was clearly directly involved in circumstances surrounding the dispute between the SSA and Thomas. At the very least Alleyne is a witness, but if Thomas is to be believed, Alleyne is a corrupt government employee and a co-conspirator. You can see the cheques and the letter for yourself in BFP’s The Cheques That SSA’s Stanton Alleyne Refuses To Explain. In the Nation a few days ago, a very upset Hal Gollop published a reply to Barbados Free Press called Gollop: Facts Speak For Themselves. After reading Hal Gollop’s Nation News article, all we can say is… yes, the facts sure do speak for themselves! “Guilty Gollop” is an unethical Barbados lawyer. The title of our piece today is actually misleading… because Hal Gollop does not say in the Nation News that he is not an unethical Barbados attorney. He doesn’t mention ethics at all in his reply to BFP’s charge. But he does provide enough information about his actions that any legal board in North America or Britain would condemn his lack of judgment and unethical behavior. Of course, this is Barbados where lawyers don’t even get disbarred for stealing over $100,000 from a client, so don’t expect to see Mr. Gollop facing a board of inquiry anytime soon! In his article, Gollop confesses that he did represent Andrew Thomas from June 19, 2001 to at least October 12, 2001 in the dispute involving the SSA contract (where then acting manager Stanton Alleyne wrote the letter to the bank and then took $1000 “commission”). Although Gollop calls this letter writing for Andrew Thomas a “purported relationship”, the rest of the world calls it a lawyer writing letters for his client. Mr. Gollop says that Mr. Thomas was less than candid with him and for that reason Gollop ended the “purported relationship” with Thomas after being on the case for some four months! Then after representing Andrew Thomas for four months, Gollop turns around and represents Stanton Alleyne over the cheques that Thomas gave Alleyne as a secret commission for the contract that is under dispute! If that isn’t a conflict of interest by Hal Gollop, then I don’t know what the hell you would call it. Let’s See Those Letters, Gollop! Were the letters written to Stanton Alleyne? Did they mention him? Did they mention the job or the contract that Alleyne wrote to the Caribbean Commercial Bank? What was Stanton Alleyne’s position with the SSA when the letters were written to the SSA by Gollop? Yes, Mr. Gollop, the facts surely do speak for themselves. What do our readers think? The comment section is open, folks! ON JUNE 29, 2008, the SUNDAY SUN carried a Front Page story under the bold headline PAY UP! and a sub head: SSA owes me $74 000, says contractor, in which the claim by contractor Andrew Thomas against the Sanitation Service Authority was set out. This story was written in the aftermath of the events which gave rise to industrial action by workers of the SSA in support of Stanton Alleyne, who was summarily dismissed from his post there. The story referred to the fact that several attorneys were “retained in the past on his behalf in a quest to claim outstanding monies owed to him” and among them “is senior lawyer Hal Gollop, who was Alleyne’s counsel in the recent impasse”. I am now aware that the possible innuendo emanating from that report has given rise to wild and reckless speculation and even accusations in a particular medium. Therefore, in the interest of accuracy, I feel constrained to state the facts. iii) Answer to Interrogatories filed on August 16, 2000. The SSA’s lawyer, Philip Pilgrim, further advised that I should check the pleading “in order to determine the veracity of Thomas’ claim”. In light of the above facts, he emphasised he saw no need for the SSA to meet with Thomas. The above chronology should clearly indicate that Thomas approached me to commence negotiations in a matter that was almost ready for trial, 18 months after litigation had begun. In short, I had been given less than candid instructions on the matter. This gave rise to an immediate end to the purported “relationship”. Can there be any doubt that these facts speak for themselves?